"They don't make 'em like they used to..."
Competition dedicated to the original weapons of war. The Military Benchrest Matches are contests that let some of the fantastic rifles of long ago come alive again and show why they are legendary. Any iron sight-equipped, centerfire rifle adopted at any time by any country for combat issue to any branch of the military, or its civilian counterpart/replica/ reproduction. All rifles must visually appear identical to “as issued” configuration(s) (with exceptions allowed as described below under Modified Class), and must be chambered in the original issue round. Post-ban rifles without pre-ban features (i.e. flash suppressors, bayonet lugs, etc.) are acceptable. Any rifle winning three matches during the seven month season will become ineligible for the remainder of that season. Stock Class (S): “As issued” original centerfire military service rifles equipped with original iron sights and their commercial clones. Barrels must be original or issue replacement. Issue triggers may be adjusted as long as they remain safe with a minimum three (3) pound pull weight. Stocks may be replaced, but must be of the same material as the original design and dimensionally identical to the issue stock. Any arsenal repair(s) or replacement parts, updates, or modifications that were standard to type are allowed. No aftermarket triggers, no aftermarket barrels, no bedding, no bipods, and no National Match parts. Front and rear sight components, such as front sight blades, may be modified or replaced to adjust elevation and/or windage for 100 yard shooting, as long as the original design/function is not altered. Sights may be painted or blackened. No telescopic or electronic sights. Centerfire military service rifles, military match rifles, and their commercial clones. Barrels must be original or issue replacement. Star gauged barrels and National Match barrels are allowed if originally available on the rifle. Barrels (except for AR-15s) may be free floated. Front and rear sights may be upgraded, including National Match and target aperture sights, but corrective and/or magnifying diopters are not allowed. Glass bedding is permitted as long as the action is still retained by the action screws. No glue-ins. Triggers may be adjusted or replaced with an aftermarket alternative. Triggers must be safe and have a minimum trigger pull weight of three (3) pounds. No telescopic or electronic sights. Eye and ear protection required. Actions shall remain open at all times except between “Load” and “Cease Fire” commands. Once loaded, no rifle may be elevated above the target or removed from the rest. Full auto and/or select fire weapons and firearms chambered for the .50 BMG cartridge are not allowed. All firing to be done from a seated, benchrest position off sandbags both fore and aft. Adjustable front rests are allowed under the front sandbag, but manipulation of any windage and/or elevation adjustments incorporated into such rests during the record portion of the match are forbidden except where competitors are sharing a rest. In this case, an initial elevation adjustment to acquire the target is permitted at the beginning of each relay. Rifles must be able to be lifted straight up out of the bag(s) without relieving tension on the bag(s). Slings may be attached to rifle, but may not be used as an aid to shooting. Any ammunition, including handloads, is allowed, as long as it is safe and appropriate for the rifles used. Ammunition may be fired from a magazine, clip, or loaded singly for the match. Brass catchers are recommended for auto rifles, but not required. Spotting scopes are required for each firing point. Each competitor must either provide his own spotting scope or make arrangements before the match to share a scope. The Match Director has absolute authority as to what is permissible/not permissible as regards any/all equipment. Targets will be provided for informal sight-in at 100 yards at least one hour prior to the squadding of the match. There will be no sighters allowed once the match begins. The first stage will consist of ten record shots for score at 100 yards within ten minutes (slow fire). The second stage will consist of ten record shots for score at 100 yards fired in two five-shot strings, 45 seconds per string (timed fire). Stage Three will be a repeat of Stage One. Stock Class rifles will be fired at SR-1 targets for Stages One and Two and at SR-21 Targets for Stage Three. Modified Class rifles will be fired at SR-21 targets for Stages One and Two and at MR-31 Targets for Stage Three. Ties will be decided by X count. At the discretion of the Match Director, courses of fire may be varied. Competitors will be responsible for placing their target frame, changing and scoring targets for each relay, and retrieving their target frame at the end of the match. Target frames will be placed on the target stand corresponding to the competitor’s bench position as assigned on the Match Score Sheet by the Match Director. Each competitor will be required to score the targets of the competitor to his immediate right. The competitor on the farthest right bench on each relay will score the targets of the competitor on the farthest left bench. The Match Director will be the final authority in any scoring disputes. The fee for participation is $5 cash per rifle. No checks, please. 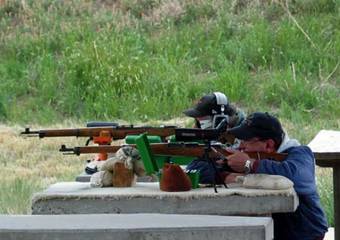 Competitors may only shoot one rifle per classification, but may shoot in both classifications at the discretion of the Match Director. (Bring two guns if you like, but be prepared to shoot only one if attendance is high.) Three dollars ($3) of each entry fee will be awarded back to the winning shooters, $1 will go to the Club, and $1 will go to the target fund. Cash awards will be presented only if there are more than three competitors per class. All matches will be squadded starting at 9:45 a.m., and firing for record will begin promptly at 10:00 a.m. No entries or sighting-in will be allowed after 9:45 a.m. An informal sighting-in period is provided from 8:30 a.m. to 9:45 a.m. on match days. The range will be closed to non-competitors at 8:30 a.m. Matches are scheduled for the second Saturday of each month, May through November.